The Villas at Woodcreek Farms is a new, gated active lifestyle community in Elgin, South Carolina. Featuring two different clubhouses with 14 tennis courts, two pools, and two golf courses, residents will always have something to do around this 58-home community. The homeowners’ association takes care of much of the basic home and landscape maintenance, allowing residents to spend time making friends and playing golf instead of doing chores. 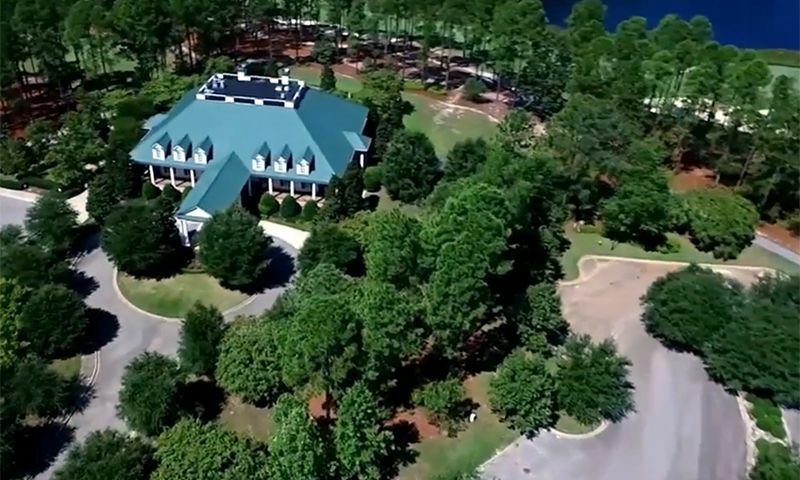 The Villas at Woodcreek Farms has a little bit of everything in Central South Carolina. Residents of The Villas at Woodcreek Farms will enjoy access to two separate clubhouses: The Members Club and the WildeWood Country Club. At the Members Club, residents enjoy access to an 18-hole championship golf course, a swimming pool and patio, eight tennis courts, and locker rooms. For fresh air, residents enjoy walking and biking along the community’s many paths and trails, experiencing the several hundred acres of parks, natural spaces, and scenic lakes. For an additional fee, residents can access the WildeWood Country Club there will be a bar and grill for eating a delicious, well-prepared meal. There is a pro-shop for all your golf shopping needs. There is another 18-hole championship golf course to play, as well as a driving range to practice your swing. There are six tennis courts available, and an outdoor pool and patio. More walking and biking trails provide additional access to large parks, natural spaces, and the scenic lakes located around The Villas at Woodcreek Farms. Executive Construction Homes began building The Villas at Woodcreek Farms in 2017 and plans to develop 58 single-family homes upon completion. These homes come in four different model collections: Sawgrass, Torrey Pines, Augusta, and Doral. Each collection offers two or three different floor plans. The Sawgrass collection offers homes ranging in size from 2,050 to 2,075 square feet in size. They include three or four bedrooms, two or three bathrooms, and attached two-car garages. The Torrey Pines collection has two floorplans available in either 2,340 or 2,840 square feet. They include three bedrooms, two or three bathrooms, and attached two-car garages. The Augusta collection has homes from 2,250 square feet to 2,950 square feet in living space. These homes offer two or three bedrooms, two or three bathrooms, and attached two-car garages, with additional parking spaces built into the driveways. The Doral collection is the largest, most opulent collection offered in The Villas at Woodcreek Farms, offering homes that range in size from 2,500 to 3,300 square feet. They offer two or three bedrooms, dens, two or three bathrooms, and attached three-car garages. All homes in this community offer hardwood floors in four different color choices, tile floors in the bathrooms, brushed nickel plumbing fixtures, a variety of custom trim packages to choose from, and comfort height cabinets in the bathrooms. A homeowners’ association fee includes lawn care, shrub replacement, common area maintenance, power washing the exterior of homes, and gutter maintenance. This allows residents to spend more time doing the things they love. You’ll enjoy socializing at the two community clubhouses at parties planned year-round by residents, golfing on the two community golf courses, and making friends with neighbors over a game of tennis on any one of the number of courts in the community. The Villas at Woodcreek Farms is situated near Interstate 20 and State Road 1, making getting around easy. A prime location for golf, there are dozens of courses just minutes away from your door. Twelve minutes away you’ll find the Village at Sandhill, a mall with over 90 stores and restaurants. Located only 25 minutes away is downtown Columbia, South Carolina. There, residents will enjoy fun and exciting activities like a college basketball game at Colonial Life Arena, a day at Riverbanks Zoo and Garden, or the South Carolina State Fairgrounds. Palmetto Health Richland is located only 22 minutes away. And when traveling farther is needed, Columbia Metropolitan Airport is just a 34-minute drive away. In the perfect location to experience and enjoy nature, but close enough to Columbia to experience all the big-city excitement, The Villas at Woodcreek Farms is fantastically located for all your needs and wants in Elgin, South Carolina. There are plenty of activities available in The Villas at Woodcreek Farms. Here is a sample of some of the clubs, activities and classes offered here. The Sawgrass collection offers homes ranging in size from 2,050 to 2,075 square feet in size. They include three or four bedrooms, two or three bathrooms, and attached two-car garages. All homes in this community offer hardwood floors in four different color choices, tile floors in the bathrooms, brushed nickel plumbing fixtures, a variety of custom trim packages to choose from, and comfort height cabinets in the bathrooms. The Torrey Pines collection has two floorplans available in either 2,340 or 2,840 square feet. They include three bedrooms, two or three bathrooms, and attached two-car garages. All homes in this community offer hardwood floors in four different color choices, tile floors in the bathrooms, brushed nickel plumbing fixtures, a variety of custom trim packages to choose from, and comfort height cabinets in the bathrooms. The Augusta collection has homes from 2,250 square feet to 2,950 square feet in living space. These homes offer two or three bedrooms, two or three bathrooms, and attached two-car garages, with additional parking spaces built into the driveways. All homes in this community offer hardwood floors in four different color choices, tile floors in the bathrooms, brushed nickel plumbing fixtures, a variety of custom trim packages to choose from, and comfort height cabinets in the bathrooms. The Doral collection is the largest, most opulent collection offered in The Villas at Woodcreek Farms, offering homes that range in size from 2,500 to 3,300 square feet. They offer two or three bedrooms, dens, two or three bathrooms, and attached three-car garages. All homes in this community offer hardwood floors in four different color choices, tile floors in the bathrooms, brushed nickel plumbing fixtures, a variety of custom trim packages to choose from, and comfort height cabinets in the bathrooms. 55places.com is not affiliated with the developer(s) or homeowners association of The Villas at Woodcreek Farms. The information you submit is distributed to a 55places.com Partner Agent, who is a licensed real estate agent. The information regarding The Villas at Woodcreek Farms has not been verified or approved by the developer or homeowners association. Please verify all information prior to purchasing. 55places.com is not responsible for any errors regarding the information displayed on this website.